The regeneration of Battersea took a giant step forward in late 2014 when the third phase of development at Battersea Power Station received the green light from Wandsworth Council. The transformation of the Grade II* listed landmark is part of a wider plan to redevelop the largely derelict industrial area of Nine Elms that will see the US Embassy relocate south of the River Thames and the building of about 16,000 new homes plus new footpaths, cycle lanes, parks, a public square and riverside paths. Estate agents in Battersea are keeping a close eye on the new riverside town centre that is being created at the Art Deco landmark, which when the £8bn scheme is completed by 2020 will include a new tube station giving access to the Northern Line extension, the reconstruction of the power station’s chimneys and the building of 1.5m square feet of retail space, 2.5m square feet of office space, restaurants and leisure attractions, a school, nurseries and healthcare facilities. The 3km extension to the Northern Line is not only crucial to the project’s success, it is part of the National Infrastructure Plan. Funding for the new transport link was confirmed by the government in the Autumn Statement 2012 and work is due to get underway in 2015. Work to breathe new life into the power station, which is the flagship development of the Nine Elms regeneration – a combination of 20 separate projects covering 560 acres of South London riverside – is based on a masterplan that was designed by Rafael Viñoly and is being carried out by the Malaysian owned Battersea Power Station Development Company. Viñoly’s vision for the 42-acre power station site, which received approval from the local authority and the Mayor of London in 2010, includes 18 acres of public space, a six-acre riverside park plus a pedestrian high street called Electric Boulevard that will stretch from Battersea Park Road to the new Battersea Power Station tube stop. The masterplan will also add about 4,000 luxury homes to Battersea’s housing stock, including properties in tower blocks designed by renowned architects Frank Gehry and Norman Foster. This third phase of the long-running and much talked about scheme was unveiled in April 2014. Gehry’s ‘Flower’ building will occupy the east of Electric Boulevard along with four other tower blocks designed by the man who created New York’s Guggenheim museum. The buildings, which will be between 16 and 17 storeys high, will include 688 new homes, a gym, shops, cafes bars and restaurants. Another 17-storey building designed by Foster will sit west of Electric Boulevard and have one of London’s largest roof terraces. It will be incorporate 617 new homes together with shops, cafes, bars, restaurants and other amenities as well as a 167-room hotel. When homes in the buildings designed by Gehry and Foster were launched at the end of 2014, asking prices ranged from £495,000 for a studio apartment to £3.2m for a four-bedroom property. It has also been reported that penthouses being built in the power station itself will sell for up to £30m. Before they will be ready for occupation, however, Battersea Power Station will have a completely new look. Construction work on the first phase of the project – named Circus West – started in July 2013, while the preliminary work on the second phase, which involves the restoration of the power station’s iconic chimneys, got underway in February 2014. The Circus West phase of the project involves the construction of 866 apartments, townhouses and penthouses, two offices, shops, and leisure and hospitality areas. It will also feature a resident's club and bar, including a private cinema, a library, private dining rooms, a business centre, gym, spa and swimming pool. When the apartment blocks being built as part of phase one are complete in 2016 they will range in height from eight to 18 storeys. The properties were marketed to investors from the Far East in 2013 when it was reported 814 had been sold off plan for between £350,000 for a studio to £6m for a penthouse suite. By late 2014, Circus West apartments were being sold in the UK at an asking price of £550,000 for studios to £1.2m for a luxury standard two-bed flat, giving the larger homes a value of £1,162 per square foot. The £750m redevelopment of the power station building, which is the main element of the second phase of the project, will see 254 flats built in the upper reaches of the building. Each of the luxury homes that will be built on the power station’s original footprint will have access to over 1.5 acres of rooftop gardens and the majority will have their own private outdoor space. The power station will be also restored, enabling it to generate clean energy by using renewable fuels. During construction, the power station’s four 101m-tall chimneys are being dismantled and reconstructed. A glass viewing platform will be installed on top of the north-west chimney that will offer 360-degree views of the city. The rebuilding of the chimneys is set for completion in 2016, while the homes being built as part of the project’s second phase are expected to be ready for occupation by 2018. As work continues to deliver Viñoly’s masterplan, property investors are buying into the architect’s vision of “creating a balanced mix of uses to ensure a fully integrated urban environment provides a new transportation solution and establishes an energy strategy that radically reduces consumption, as well as generating a clean supply through the use of renewable sources”. When properties in this phase were launched in April 2014, studios were valued at £800,000, one-bed apartments cost from £1m, two-beds from £1.5m, three-beds from £2.7m and four-bed homes carried a £4m asking price. And by the end of 2014, more than 90% of the homes on offer had already found buyers, including multimillionaire pop star Sting, whose purchase strengthens the iconic building’s links with the arts that was cemented by Pink Floyd in 1977. Battersea Power station remains the largest brick building in Europe. Since its twin turbines stopped producing electricity in 1983, there have been many proposed uses for the site, including a museum of industrial heritage complete with a full-sized replica of the Crystal Palace and Zeppelins moored outside, an urban park, a psychedelic Las Vegas-style hotel, a permanent home for the Cirque du Soleil, a giant rollercoaster and even a new home for Chelsea Football Club. Few sites on the south bank of the River Thames have as rich architectural heritage. The exterior of the structure was designed by Sir Giles Gilbert Scott, and was built in two phases between 1929 and 1955. The western half – Battersea A – was built between 1929 and 1933 in the Art Deco style. It has a steel girder frame with a brick-clad exterior and reinforced concrete chimneys. The ornate interior was lined with faience and marble and featured parquet floors, wrought iron staircases and sculpted bronze doors. The eastern half – Battersea B – took from 1941 to 1955 to construct and was built to match the design of the western section. 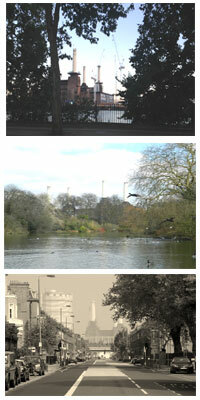 Battersea A ceased generation in 1975 and Battersea B in 1983. The iconic building has been Grade II* listed since October 1980. 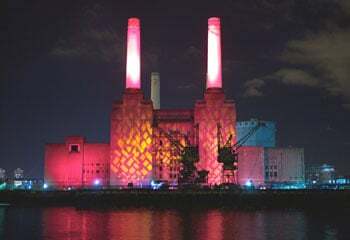 Three years previously, the power station was assured of its place in cultural history when it featured on the cover of Pink Floyd’s Animals album. However, after redesign of the site was awarded to a consortium led by John Broome, the brains behind Alton Towers, in 1984 the roof and west wall were demolished in 1989 to remove the boilers and turbines as part of the work to convert the building into a theme park. Financial difficulties forced Broome to abandon his project but the roof and wall were never replaced, leaving Battersea open to the elements. The site passed through a number of owners, including Hong Kong firm Parkview and Irish developer Real Estate Opportunities, until it was bought for $645m in 2012 by current owners Malaysia-based developer SP Setia, conglomerate Sime Darby. What was an ideal site for a power station in 1927 – when planning permission was first granted – has become a perfect residential location today. From its vantage point at the riverside, Battersea Power Station occupies one of the most accessible and desirable points on the London map. As well as enjoying the unique amenities of their own neighbourhood, residents will find themselves surrounded by all the best elements of the city, from bustling shopping streets to leafy park walks. A short stroll away, Chelsea and Sloane Square gleam with beautiful stores and tempting restaurants. Walk in another direction, and without even crossing a road, the site leads directly into the 200 rolling acres of Battersea Park.